After sub-zero family ski trips to Crystal and Boyne mountains, we left Michigan in a snowstorm on January 8th driving to The River Forest Marina in South Central Florida. Two hours after arrival we greeted friends Ken and Jeanne (Daybreak) for champagne onboard to celebrate the Namaste Too and dinner out at Forreys. After sharing dock space with them on Marathon last winter, it was great to spend our first hours on Namaste Too laughing and catching up. 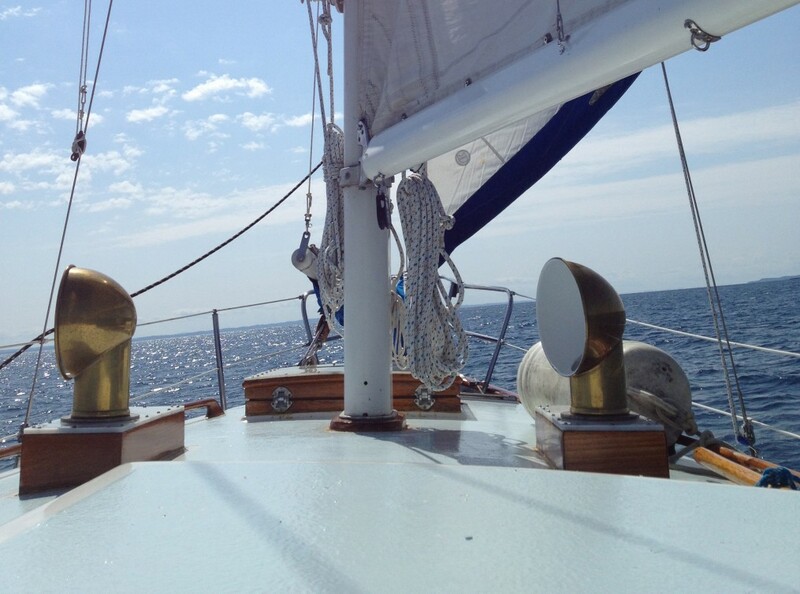 The following morning we began two full weeks living onboard Gypsy, learning her every nook, cranny and system. The time has flown by, the many assets and few challenges have affirmed our decision and we feel like she is slowly becoming ours. Saying “Hi” to the Namaste Too as owner! This marina, on the Okeechobee Waterway – 28 miles east of Lake Okeechobee, may be one of the quietest places on earth – a good venue for learning and practicing. It is a working marina with only two live-aboards, us and Paul onboard the 72’ Hattaras, Maralonna. Later joined by Bryan and Kelley onboard the Vagabond. Mostly it is skilled professionals working on huge yachts! Twelve miles away is the closest town, Labelle. We have gotten to know most aisles of the local ACE Hardware and Walmart (not something I had particularly aspired to in retirement) where we have purchased the essentials until we meet our Amazon deliveries in Fort Pierce on February 1st. We are happy to have our car which is now stuffed with what we don’t want/need on the boat but cannot give or throw away. Also, in Labelle there are a couple of restaurants worthy of mention. First, is the Log Cabin BBQ where it is perpetually Christmas. Around 4 pm one shopping afternoon we had dinner with a standing room only crowd. We each ordered the “usual” consisting of chowder, salad, beans, coleslaw, pulled pork, baked potato, Texas toast, ice dream and a soft drink for $7.99. Second, we had two dinners at Forreys, the high-end place in town with the best chicken/melon salad I have ever eaten – called, of course, the “local favorite”! Otherwise not much else is going on in this cowboy, county seat except the gas station turned laundromat, a culture unto itself that I believe I mentioned in a previous entry. When you need clean clothes. . .
Our new-to-us boat is Jim’s problem-solving paradise! It took a couple of days to figure out that the water heater needed a new relay switch and how to work the remote for the heating/cooling system. In addition to general cleaning, inspection and maintenance the Captain installed 3/8” dowel stock to hold jars in the ref door; tied new lines on the bumpers; put new bulbs in the running lights; hand-crafted and installed a lock on the port door; purchased and installed a new smoke/co alarm; got all three vhf radios working in sync; purchased and stowed new safety equipment (flags, flares and gun); ran down a leak in the deck that requires repair; determined the need for, purchased, and installed 8 new batteries (totaling 880 amps). Now on to the issue of the electronics cutting out momentarily when the bow thruster is in use. It all works but what now? I have spent most of my time cleaning, arranging, and rearranging and cupboards. I wonder how many times I have touched each item? There must be an app for that? While there is lots of storage, figuring out the best place for everything and putting everything in its place feels like doing a jig-saw puzzle without a picture. What do I like best about the Namaste Too you ask? Well, in no particular order of importance, I love the continuous hot water, comfortable chairs, a real refrigerator, queen bed with great mattress, real shower, lots of daylight, electric heads, huge water and holding tank capacities, new electronics, two helms, two state rooms, two heads, ease of getting on and off the dock as well as walking around on the deck. What I will miss about the Namaste is her nimble simplicity and our familiarity with her. Tomorrow morning we will raise the new Loop Flag, cast off the lines and head for Clewiston, a 28 mile shake-down trip! Sammy Sayz – Hi Guys! Well, here we go again! I have tried to help with some of the chores but without thumbs my skills are pretty much limited to watching and waiting to go for a walk. Today while they weren’t looking I wandered over to the work yard to see if they needed any help. I was summarily taken home by the marina manager. Time will tell how I like the new adventure but so far so good. Quote: “We may have all come on different ships, but we are in the same boat now.”-Martin Luther King, Jr.
← The Namaste completes half her loop, suffers serious internal injuries and retires to Indiantown, FL. Looks beautiful and yes, the chairs look quite amazing. It appears much bigger then Namaste? More room to roam. Have a beautiful time on the waterways and travel safe. Good grief, Helen? I wonder where that came from, interesting. Haha. OK, I see now, I changed it. Hi. We, Chris and I, just retired and bought an Albin 36 after a lifetime of sailing our Cape Dory 36 (which we kept.) We live in St. Joseph, MI. The trawler is on the east end of Lake Ontario. Our plan is to cruise her home by way of the Thousand Islands, Trent-Severn, Georgian Bay, North Channel, Les Chennault Islands, Mackinac, Lake Michigan and home. So sorry to hear about the loss of Namaste, and so pleased to “meet” some fellow sailor/trawler owners. I hope we can stay in touch. Best wishes. David VanDenburgh. “Molly”, 1979 Albin 36.